The crowd was at capacity for the most recent Funky Monday show with friends, family, supporters, and fans standing shoulder to shoulder at High Noon Saloon in Madison. But for the first time, the star would not be leading the groove at this monthly musical gathering. Clyde Stubblefield, the man known as the Funky Drummer for James Brown, had died of kidney failure on February 18, 2017. He was just 73-years-old, and for more than half of his life, had called the Madison area his home. Clyde had many friends, but few may have known him as well as two of his bandmates in the Clyde Stubblefield All-Stars. I talked with singer Carolynn Schwartz Black and fellow drummer Joey B. Banks about Clyde’s influence on their lives, and why they feel it is important to keep his memory alive. Maximum Ink: You both knew Clyde a long time. How did you meet him? Joey B. Banks: We met in 1982 at Club De Wash in Madison at Paul Black’s Blue Monday show. We started hanging out together with a whole bunch of great area musicians, and many are still active and playing today. MI: So, Clyde helped both of you find your place in the music scene here. But during the last few years, you helped him get some recognition for his talents. Why was that important? Joey: I had felt for a long time, Clyde wasn’t getting any “official” recognition for his impact on the Madison music community, or the music industry. It pissed me off that some people saw him as just another local artist, not a national treasure, or iconic figure like so many fans already did all over the world, and I wanted to change that. The Coalition for the Recognition of Clyde Stubblefield was created, and we began the mission with his comeback (after a couple years off) at a series of scholarship benefit concerts in 2015. We started it off with the return of Funky Monday at the High Noon Saloon in August of 2015. It just meant a lot to me that he was back behind the drum kit where he belonged. Then, October 8, 2015 was declared “Clyde Stubblefield Day” by the City of Madison. I knew Clyde was back, his smile was back, it was just a beautiful thing to see and be a part of. He thanked me after every show, and he always said it was the most fun he ever had playing with another drummer; the highest compliment he could ever give me. Carolynn: Before moving to Madison, I lived in NYC and volunteered for Musicians on Call, a non-profit that sent musicians to hospitals and hospices to play for patients who couldn’t leave their beds. The experience stayed with me, and showed me the healing power of music. So when Clyde was in the hospital after he lost his thumb and part of his forefinger in an accident, I went to visit him and brought my guitar with me. I started to play “Baby, I Love You,” one of our regular Funky Monday tunes, and he picked up the knife from his lunch tray and started to tap out the beat, smiling his big smile the whole time. He was born with the beat in his soul and I knew that getting him behind a kit was probably the thing that would save him. As far as the recognition goes, I think as a songwriter myself, I would be pretty pissed if someone stole my stuff and didn’t pay or credit me for the work. Clyde had always said it wasn’t so much the money, but the lack of credit and recognition that bothered him. I would like to think he was pleased to finally get some acknowledgement for his talents. MI: You had a special friendship, beyond music, with Clyde. What does it mean to you now? Carolynn: Clyde was the most generous musician I ever had the pleasure of working and playing with, and he was also a generous and loving man. We always got a call on New Year’s Day from Clyde that ended in “We love you,” and makes me wish I had saved those messages. He was sweet and funny, and gave me my name “SoulMama.” He also had a long-standing poker game on Sunday nights, but for me those games were more about the camaraderie than the poker which was all low stakes, though occasionally the pot would climb up to $50 or so. Me and a bunch of drummers. Drinking, smoking, playing cards, listening to music. I really hope we can carry on that tradition. Joey: It is difficult to put into words how much Clyde meant to me as a friend, mentor, and band-mate. I truly loved the man. He was the most humble, kind guy you would ever meet. And he was an inspirational and supportive figure for me. He gave me the confidence and drive to be a professional drummer, and to pursue a career in music. He taught me how to be humble, but confident about my abilities. He would always say, “Do what you do” and “Be yourself” Clyde inspired and helped many of us realize our own talents. MI: Will Clyde’s All Stars continue to play, and are there are other ways you still hope to honor him? Carolynn: I am happy UW-Madison is planning to honor Clyde in May with a posthumous Ph.D. and I will be at the awards ceremony. I am also happy to see artists like Questlove and Chuck D praising his talents, but I’d still like to see some money where their mouth is, too. Of course, I will continue to sing with the Clyde Stubblefield All-Stars as long as people keep hiring us. And I am creating a new coloring book called “Give The Drummer Some” that should be available in a few weeks. All the proceeds will go to the Clyde Stubblefield Scholarship Fund. Joey: My tribute to Clyde is going to be by continuing to encourage young drummers, artists, and human beings in general to be humble, kind, and strong every day. I will miss our Sunday card games, I will miss sitting next to him, and watching that giant smile, and watching that legendary “Left Hand” at Funky Mondays. But the Clyde Stubblefield All Stars will continue as a Clyde Stubblefield Tribute Band, and we are already getting performance requests and bookings from around the Midwest for this summer and fall. 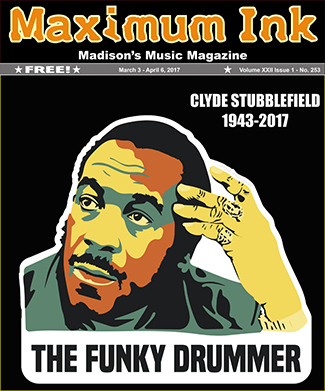 We will continue Funky Monday as a fundraiser for the Madison Area Music Association’s Clyde Stubblefield Scholarship Fund, which will support students who plan to study music in college. The spirit of Clyde Stubblefield will live on, I promise you that.